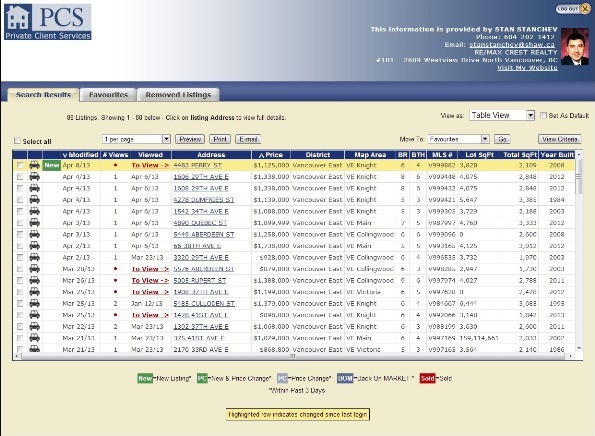 Vancouver MLS Listings Search emailed to you the moment the listings hit the market. -Create our own Search. View New Listings just like Real Estate Agents Do Simply enter your price range, desired features and location. -Color pictures and comprehensive details of each home. Not a member yet? Sign up with the form on this page and get access to dozens of listings every day before everyone else sees them. There is no cost or obligation to use this exclusive service, but the Real Estate Board of Greater Vancouver requires you to sign up for this level of access. You may discontinue this service at any time, and you are under NO obligation. Put PCS Exclusive Members Portal to Work for You. Buying real estate in Vancouver is very competitive. The early buyer gets the worm, so to speak. Why not have all the tools at your disposal in order to spot the best deals before the rest? Information on the public websites MLS.com and Realtor.ca lags behind anywhere from 1-4 business days from the time it is uploaded till it’s publically available online. Once a Realtor posts a new listing on to our internal MLS system, it is immediately available to all Realtors and to you. So you can be the first one to know about a new listing or price changes matching your search criteria. For the regular buyer it takes 1-4 days before they can see the same listings uploaded to MLS.com and Realtor.ca. When you sign up for our Exclusive Members Portal called Private Client Services (PCS), you can build your own online home searching MLS profile getting listings from the Realtors internal system, in real time! You will build your own portal so that it will automatically notify you the instant a property that matches your search criteria is uploaded on to the system. The rest of the public may not see the property for days! You will be able to access complete listing details, not just the limited data available on Realtor.ca. Even better, your customized portal is searching away for you while you are at work, at the gym, making dinner, you name it. No more spending hours online looking for listings when our unique Exclusive Members Portal is doing the searching for you. Click the picture or the link below to view a functional sample of our Private Client Services “PCS” MLS search. Play with it. Sort the listings by clicking the description on top of each column. Click on the SOLD properties to see their actual selling price. Mark the boxes on the left and move the properties you like to your “Favorites” folder or the once you don’t like to the “Removed” folder. Click on each property address to view the complete MLS information for each property, the way we see them as Realtors. Open the tabs on the top of each listing to view the cool “Location” feature with Street and Bird’s Eye Views too. Enjoy the full-size Photo Gallery and Multimedia, when available. Don’t forget to check the Mortgage Calculator with required monthly payments, based on the asking price of each property. Check the Buyer’s Qualifier if you can qualify for the monthly payments. This PCS search can be tailored absolutely no cost and obligation free for you by filling the Request form on this page. If you are thinking of selling your property and you want to know the actual recent sales in the area go to “Sellers“ and fill the MLS Market Snapshot form or the Comparable Marketing Analysis form. Enjoy this obligation free VIP Real Estate MLS information. Thank you in advance for emailing this page to friends and colleagues and sharing it on your favorite social media networks. Please use the “share” buttons below.